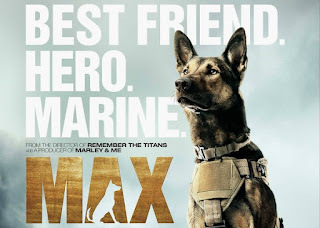 Inevitably, the Marine does, in fact, die in battle, and Max is inconsolable. Max is notably aggressive toward everyone who tries to handle him, and he particularly does not like the handler's best friend for life, played by Luke Kleintank. We learn early on that Luke is doing something very bad having to do with stealing arms from the Taliban, but we'll go into that a bit later. Max eventually decides that younger brother Josh smells enough like his beloved dead handler that Max will obey this smaller version. 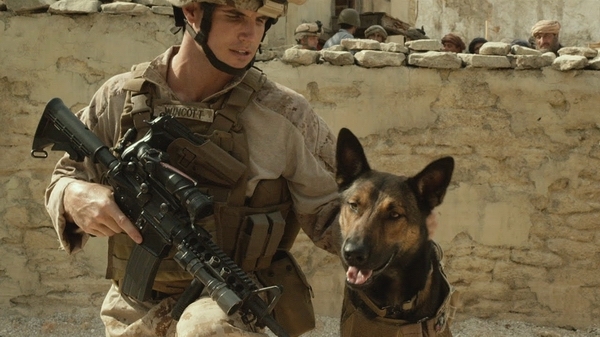 The Marines decide that Max can't stay in the military, as he is a dangerous weapon that will attack and kill anyone on either side indiscriminately. Obviously, they just give him over to Josh and his family to let loose the horror of a dog-based bloodbath on the streets of hometown, USA. The story is not a complicated one. Kid doesn't appreciate sibling who gives his life for his country, kid inherits dog, kid hates dog, kid gets girlfriend, kid loves dog, dog saves kid. It's not complicated, and it doesn't surprise the viewer at any point. That said, it is a nice story that kids can watch, relate to, and enjoy. I mean, who doesn't root for the plucky pup that everyone is willing to write off? It's like Benji as a more aggressive, more modern story. Hey, Max. One of us is going to die soon! The only actor I could recognize in the movie was Thomas Haden Church as the stern father. He's about as cookie-cutter a character as you can get, so it doesn't require a whole lot. In fact, all of these characters are straight from the kids movie template, so none of them have to act all that much - which is good for many of them, as this movie isn't dripping with talent. Bottom Line: A kids movie that updates an old idea well enough for kids, but not for adults.